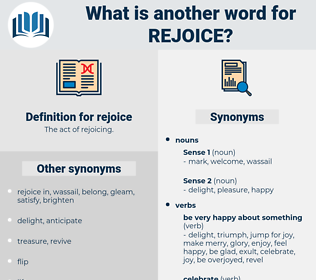 What is another word for rejoice? mark with a red letter. 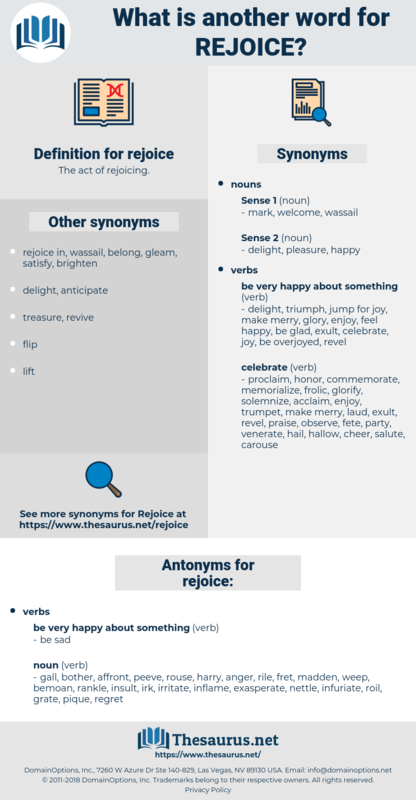 gall, bother, affront, peeve, rouse, harry, anger, rile, fret, madden, weep, bemoan, rankle, insult, irk, irritate, inflame, exasperate, nettle, infuriate, roil, grate, pique, regret, vex, distress, steam up, chafe, put out, bug, perturb, aggravate, provoke, pester, incense, bewail, harass, ruffle, offend, outrage, get, displease, upset, agitate, enrage, cross, disturb, annoy. I rejoice your journey was swift. I should like, of course, to set them all at ease, but as I can do no more than make a home for Ermine and her niece, I can only rejoice that Alison is with you. rajah, rousseau, rissa, Rus, rise, roux, r.c., risc, roccus, rick, rachis, re-echo, richea, rhesus, reecho, riga, rockies, rook, rush, rosa, rescue, rock cake, ruscus, rye whiskey, rhexia, rich, rogue, rack, roguish, rice, risk, reggae, rosy, rework, reassess, rouge, rask, risky, reissue, rous, rug, reccy, resh, rusk, raj, rehash, rehouse, ross sea, rosaceous, rose acacia, recuse, razz, ricksha, reich, russia, re-argue, rookie, reuse, rose, rickey, rico, risque, rucksack, rye whisky, rag week, rock, rickshaw, ragi, raze, rough-house, roughhouse, ruga, raucous, raise, race, rorschach, roughage, rachischisis, ruckus, racy, Rya Rug, resize, rig, Reyes, rugose, ruscaceae, recce, roseau, roc, roughish, rage, rhus, rase, rosaceae, res, riches, rocky, rehearse, rag, ragee, rejig, Rex, raree-show, ruck, rushy, ras, recco, reseau, row house, reek, raja, rosacea, rake, ross, rakish, rioja, ruse, rockchuck, rough-hew, reach, rococo, roach, recess, rash, rough, resew, ragusa, RG, raceway, rush away, rouse.